In the early 1980's we began installing closet sheving. Since that time we have literally installed hundred thousands of feet of closet sheving. We are the professionals. Whatever design, type or configuation you like, we can install. 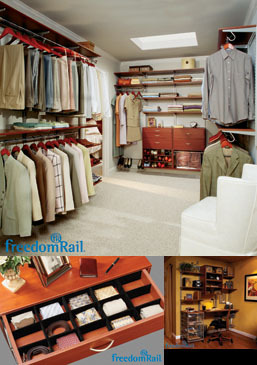 From a single shelf to a total custom walk in closet using exotic hardwoods, we are the right choice to organize and make your closets shine.